Do you want more organic search traffic to your site? I’m willing to bet the answer is yes—we all do! On average, people consume 285 pieces of content or 54,000 words every single day. Your site's content has to slow the person down and prevent them from clicking another link. It has to get them to stop, read, think, learn, and consider what you have to say. 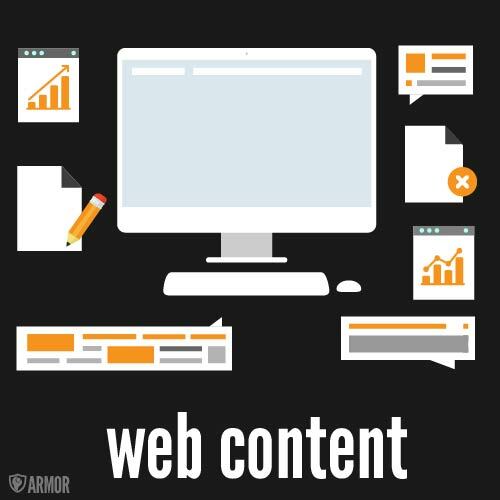 Here at Armor, we offer a range of content creation services, from blog posts to expanding the content on your site. Content Marketing is the de facto way to increase your brand, company, or product's presence and awareness—from digital to print marketing getting your name and face in front of as many potential leads as possible. If your site isn't ranking well, it's because Google doesn't think the page is worth indexing, and it's probably because of the content. Great content is the #1 factor in getting pages indexed on Google, as of late 2017. According to We understand that you need to spend your time running your business and getting quotes, products, and services rendered so you can make money. Check out our content marketing services below and let Armor help your content marketing today! When people first started blogging, they mostly wrote personal accounts sharing their lives or their travels, using it as a medium to tell a story or share an experience. And while people still do this today, blogging has evolved into a much more valuable content medium, especially for businesses that offer a product or service. Why do you need a blog? It’s simple: blogs are hard-working SEO machines. 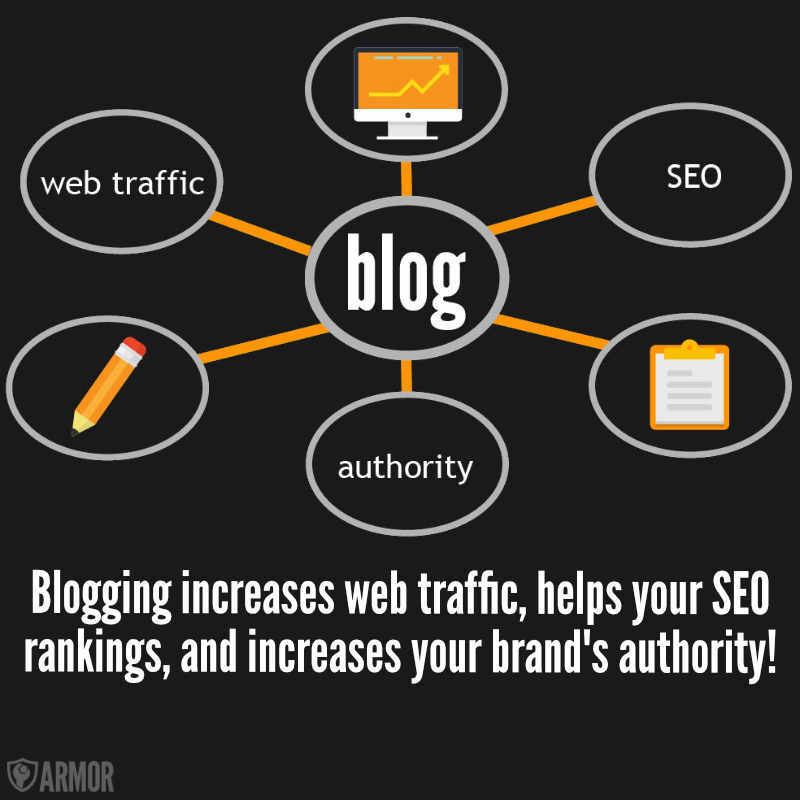 Blog content gets crawled and indexed more quickly than static pages. Yes, it does require consistent effort. You do have to write (or outsource) high-quality, in-depth blog posts (of at least 1,000 words) on a regular basis. But the rewards, we've found, are absolutely worth it. Over 76% of business-to-business (B2B) marketers use blogging, and it's arguably the most popular and used content marketing platform. Think about a stranger searching for information online. They have questions or problems that they're looking to solve. If your blog posts provide those answers, those strangers will find your posts, and they will want to click through and read them, turning them into visitors. Blog posts allow visitors to your site to learn more about you & your business, and additionally, opens a dialogue between you and potential customers. Plus, every time you publish a blog post, you're creating a new, unique page online. This means that you're increasing your chances of ranking in search results, having other websites link to you, and being shared on social media. And all of this results in new traffic to your site, which can be converted into new leads, customers, and sales. Our professional staff writers will ensure that your content is appealing to your visitors, that it is free of any mechanical errors, and that it falls into your brand, business, or industry perfectly. Web pages are arguably the most popular source of content ever. The internet is full of them, and they contain everything from service information to frequently asked questions and even galleries of products or services that a company has. If you have a website already, we can take the content you already have, expand on it to make sure it is capitalizing on SEO and Page Rankings, and generally make sure it looks and sounds qualified, authoritative, and professional. So much of the content on the web is lackluster and easily forgettable—don't let your content fall the same way! In a world of low-quality content and countless websites (over 1.24 billion in 2017), useful, informative, and engaging content stands out, giving your site a greater chance of success as a result. Content is not just there to showcase your product or to describe your service. Your content is there, published online, because it is relevant to your audience, because it demonstrates that you are the expert in your market, and because it will engage, entertain, and inform the searchers that land on your site. Think about your average search habits. When you look for something on Google or Bing, you're probably looking for an answer to a question, or someone who has had a similar experience with a problem. Your website's content should answer those questions for your business, brand, or industry, and should be helpful and engaging. Your webpage content should make your brand the choice, rather than a choice. Email campaigns are a great way to inform your customers about new products or services you offer. I've gotta say, I'm a sucker for GIFs. They're easy to consume, they catch your eye, and they have an emotional impact. You can use animated GIFs in your marketing to show a fun header, to draw people's eyes to a certain part of the email, or to display your products and services in action. Email marketing might seem like an outdated medium—with every single one of us having an inbox that is full of spam, advertising, and content offers we probably haven't even looked at. The key for email campaigns is to focus on enticing and engaging the viewer from the start; using an engaging subject line, multimedia content, and having large call-to-actions (CTAs) throughout your email campaign will ensure that more readers open and engage with your email campaigns. At this point in the digital age, most businesses run their communication through email, and anyone with a smartphone or internet access probably has an email address, too. This allows for email marketing and email campaigns to be a safe form of marketing - as you can be sure most people will at least receive your email. And with over 2.5 million emails sent in any particular second, email campaigning can be key to getting your brand to the world. 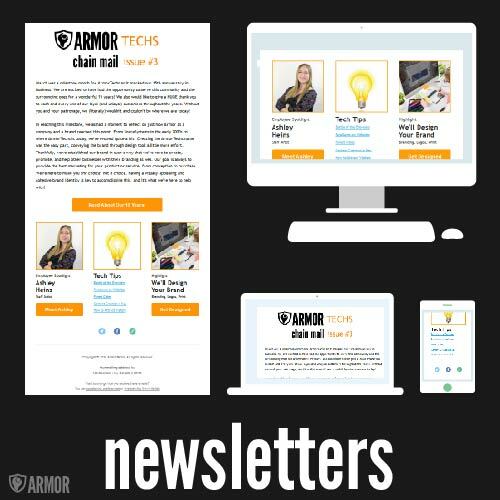 The content of your emails is key for turning readers into leads, and pushing them down the sales funnel—here at Armor we produce quality content that drives clicks back to your website and products, helping your business to construct and utilize that sales funnel. You might be thinking, "It's 2018—why the heck would I want to pay for print material when email exists?" Well, the fact of the matter is that print marketing is still widely popular, and can lead to more engagement and a sense of tangibility in your marketing. An email can be forgotten and pushed down into the nether that is an inbox, while a printed postcard is physically in the hands of your readers, forcing them to make the decision on what to do with it. Chances are, if your print material is engaging, relevant, and well-made it will live on the fridge or in the pile of "important" papers, rather than being forgotten or being discarded right away. 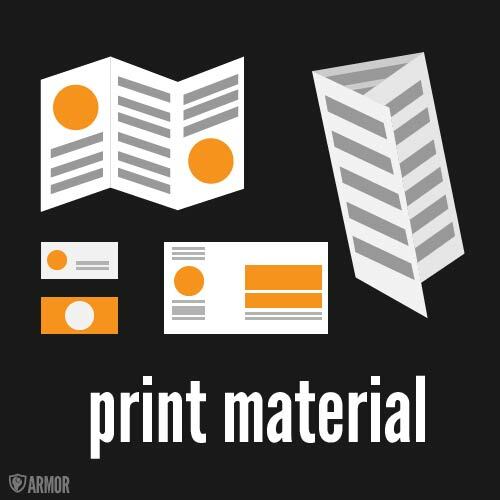 Print also further establishes your brand recognition, as your logo, colors, and font will be on the medium and in your potential customers' hands—making it even easier to get your brand recognized and build up your authority. Are you interested in content marketing for your business? Contact Armor with the form below, and we will get your site looking the best it can be. Do you have any other other questions?